Ding, ding, ding… We Have a Winner! Today was the drawing for the winner of my apron giveaway. Thanks to everyone that visited my little corner of Virginia and entered the drawing for the giveaway. I tried to respond to each and every comment, but due to one of those mysteries?? of Typepad, not all the comments were pushed through to my email. I did read every comment and thank you so much! congratulations Maria! What fun! I know you are thrilled! Lucky girl! And what an interesting photo displayed. Congrats!!! 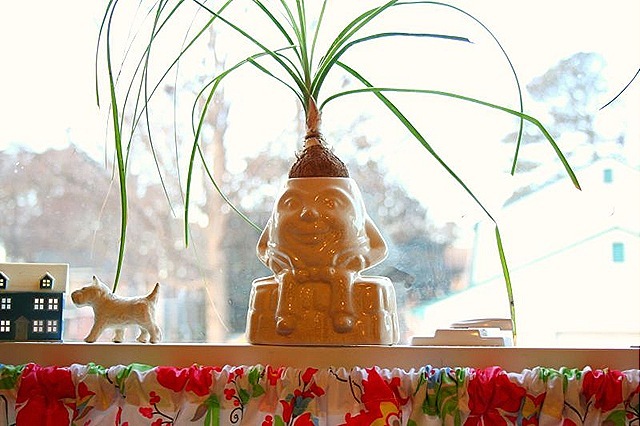 Love the humpty dumpty planter too Miss Suzy! Congrats to the lucky winner! ~Smiles~Tam! Love Humpty, what is this curtain fabric? Is it new or vintage? LOVE the colors!